Many thanks to LKC reader Doug T- he sent me a care package last week full of goodies from his kitchen -- several grilling glazes, a hot sauce, and bread and butter pickles made from jalapeños instead of cucumbers. He writes that he grows about 1,000 pepper plants each year to feed his addiction -- I mean prepare his products. I haven't cracked any of them open yet because I'm hip-deep in the Louisiana Kitchen & Culture 2018 Holiday Food Guide. By the time I'm done with it the weather should be cool enough to enjoy cooking outside. 1. Buy tickets to the event, if you can be in New Orleans on October 8. Patron tickets are $100, general admission $50. Make sure you select Barranco & Ford team; our chef partner is Aaron Burgau, a King of Louisiana Seafood and co-owner of Patois and Central City BBQ. 2. Donate money. No amount too small! Don't forget to select the Barranco & Ford team. Café Reconcile changes lives by offering life skills and job skills training for at-risk youth, many of whom have no place else to turn. I have supported the organization for years, and have personally seen doors and opportunities open up for countless young people. Email or call if you have questions about the organization; let's go for lunch if you find yourself in town. P.P.S. Watch for renewal notices in your email box; For some of you, the current Sep/Oct issue is your final issue. Emails will be going out over the next few days. 4 Tips for Dry-Heat Cooking. The trick to this is to cook the bacon until it's almost done before wrapping the oysters and finishing on the grill. The bacon will be perfectly crisped and finished in the time it takes to cook the oysters. So bake a lot of bacon before game day, stock up on shucked Louisiana oysters, and produce Oysters en Brochette on demand. Your guests will be in awe. Surely you've heard the expression "it's like eating popcorn shrimp" -- used to describe something that's very simple, and/or addictive. Well, that's why you should plan to make several batches of these shrimp; the first batch will disappear as quickly as you can pull them out of the hot oil. Have plenty of cocktail sauce on hand for dipping. 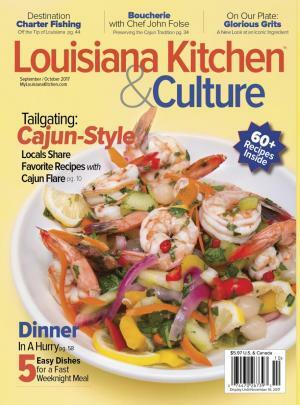 Louisiana Kitchen & Culture magazine subscribers only! You'll find this decadently delicious recipe on page 29 of the Sept/Oct 2017 issue; LKC reader Tommy Centola created it for his mother-in-law, Lorraine. Not a magazine subscriber yet? Try our special $10 TRIAL subscription and get the next 3 issues; you'll get this issue next week. Click below to order.